For the first time in over 20 years, the staff at Energize, Inc. has hijacked the Volunteer Management Hot Topic from Energize’s founder, Susan J. Ellis. It’s true that for the past several months, Susan has reduced some of her responsibilities at Energize to focus on her health. But, that is not the reason for our civil disobedience. We have jumped up and grabbed the reins of Susan’s monthly Web vehicle to draw attention to a significant event. On the 18th of this month, Susan will celebrate her 70th birthday and Energize’s 41st birthday. We don’t want to let this moment pass without acknowledging Susan’s impact on us and the field of volunteerism. On March 18, 1977, Susan celebrated her birthday by founding Energize, Inc., offering consultation and training to the world of volunteerism. She presented the most effective ways to involve volunteers in every aspect of an organization, with her “say-it-like-it-is” style mixed with her deep understanding of the field and creative ideas. Since then, Susan has assisted clients throughout the world (23 countries) to create or strengthen their volunteer corps. During this time, Susan also authored or co-authored 14 books, several of which have been translated into Japanese, Taiwanese, French, and Italian. From 1981 to 1987, she was editor-in-chief of The Journal of Volunteer Administration. What’s more, she has written more than 120 articles on volunteer management for dozens of publications; posted the provocative “Hot Topic” essay on the Energize Web site monthly since 1997; and written a national bi-monthly column, “On Volunteers,” for The NonProfit Times. Phew…and that’s not all. Over the past 41 years, Susan developed Energize into a multi-faceted company with support across the globe. In addition to consulting and training, Energize publishes, sells, and distributes books to give voice to the best volunteer management materials available, which have often been overlooked by traditional publishing houses and bookstores. With the advent of the Web and Susan’s fascination for technology, the Energize Web site has evolved into thousands of pages of free volunteer management information for all to access. With fellow experts in volunteer management, Susan played a key role in launching an online venue, e-Volunteerism: The Electronic Journal of the Volunteer Community, to take leaders of volunteers deeper into the history, theory, and philosophy surrounding volunteer leadership and social engagement. As online technology advanced, Energize kept up. The Energize team created the Everyone Ready® Volunteer Management Skill-Building Program, designed to deliver quality online training and regular communications to individual learners or an entire network. Susan is committed to the advancement of volunteerism as an invaluable social structure, the support of the leaders of volunteers in their drive to empower volunteers, and the acknowledgment of volunteer resources management as a true, respected profession. Susan continually serves as a volunteer herself: she was involved in the Association of Volunteer Administration in its early years; has spoken publicly for the rights of volunteers and their leaders; written letters to top government officials (including the president of the United States); and just last year shared her marketing expertise in support of the National Summit on Volunteer Engagement Leadership. Her passion cannot be questioned. She has touched us all and influenced the field in ways we cannot measure. We, the Energize staff, applaud Susan’s contributions and share with her our heartfelt birthday wish. And, we look forward to continuing the good works of Energize! Please join us in the Comments below by sharing a birthday wish or a brief story about how Susan (or Energize) made a difference in your volunteer management career! Susan has been a friend, a mentor and a colleague for over twenty years. Throughout my career, I have been fortunate to be able to call on Susan for advice, insights and support. Susan and I speak regularly about volunteer management, politics, the state of the world, movies, science fiction and a host of other issues. I have learnt so much from her in my career but perhaps the best thing I have done through knowing Susan is to write for our field. I went on Susan's 'nag list' many years ago and have benefitted from her encouragement, counsel and advice as I have honed my writing skills. The writer I am today is because of Susan. As we look forward to 'our' birthday on 18 March (Susan and I were born on the same day, but not the same year!) I am excited to celebrate her milestone 70th with her. Happy birthday Susan! Congratulations and Happy 70th Birthday to a wonderful colleague and mentor! Susan, I don't know what "70" translates to in unicorn years, but you have earned every single one of them! I have truly enjoyed our decade of working together. Your expertise, knowledge, and contributions to the world of volunteer management are simply unparalleled. It is indeed a pleasure working with someone who has such an impressive command of an entire professional field. And your perseverance and strength during these last few months has left all of us in awe. As one of your many editors, my only goal now is to convince you to drop the serial comma! Susan, I can't imagine where the profession would be without your passion, dedication and brilliance- to say nothing of your humour, kindness and generosity. I reached out to you years ago with an idea for an article- you not only responded but encouraged me and an incredible friendship was born! Every time we connect, I walk away having to write down the million ideas, resources and one-liners I take away. Happy Birthday Susan! Energize was one of the first resources I and many volunteer managers discovered when we began our careers. Susan's was the voice in the wilderness, guiding us, comforting us and encouraging us to be better and lead. Somehow, between reading her books and the resources on Engergize, we were able to make it through the challenges. Her advice stuck in our heads. Her words became our words. Her determination became our determination. Thank you, Susan, a very happy and wonderful birthday to you.. Happy Birthday Susan! I remember the first time I met you at the Retreat for Advanced Volunteer Management in Canberra many many moons ago! You inspired me then as you inspire me now! I honestly believe I wouldn't still be in the profession if it weren't for Susan's wisdom and counsel which I once sought out! The profession is stronger in Australia and New Zealand thanks to your advocacy and your passion. I hope that on this birthday you reflect on the fact that you have touched the lives of many people around the world and we say Thank you for that! I met Susan many years ago when I was managing a Volunteer Centre. She encouraged me to produce a toolkit for Volunteer Speed Matching based on speed dating! It was great to work with her and meet up in Philadelphia. Such an inspiring lady! HAPPY birthday Susan! Your writing has been a GO TO RESOURCE in many situations. You are an inspiration and a wonderful teacher! Thank you for sharing your brilliance. Hope you can grace our city someday AGAIN! Cheers!!! Having almost literally sat at the feet of Susan Ellis as a young professional, it has been one of my life's great pleasures to get to know her personally over the years. She still remains at the top of my list when it comes to very smart, creative people who are giants in the field. I will always remember Susan's response when Jill Friedman Fixler and I asked her, "What can AVA do for us?" She said, "wrong question.....it's what YOU can do for your professional association." That got us involved, and we learned that it truly works both ways. I never tire of hearing Susan speak on almost any topic - her incredibly sharp brain, her ability to articulate in a way that really makes the point, her ability to challenge our thinking, and her sense of humor keep me fascinated. Add to that all that she has done, both personally and professionally, for so many of us and our family members, and we all owe her deep thanks. Happy, happy birthday, Susan....and many, many more. Thank you for your immense contribution to volunteer engagement,... and Happy 70th!! Happy Birthday Susan. I first met you in Hawaii when you spoke at the Network of Volunteer Leaders conference. That was in the 80's and your enthusiasm, incredible knowledge, warmth and motivational style influenced me then and still does today. You have given so much to the voluntary sector and we are better leaders because of it. Thank you - your influence has kept me in volunteer sector for just a 'few' years. Sending my very best wishes for a wonderful birthday. Happy Birthday, Susan, and thanks so much for your guidance through our challenging profession. Have a great day and a wonderful year! Energise has been my go to since being appointed to this role. It provides the diversity and advocacy I was seeking. It has provided me with solid reference material when I am championing a cause or writing a paper. Thank you Susan and team for your tu tangata, aroha, whataute, te hiranga, mahitahi and kaitiakitanga; integrity, compassion, respect, excellence, teamwork and stewardship. Happy Birthday. Thank you for pioneering the way for all of us professionals. I had the pleasure of receiving your book over 13 years ago as a new young professional and meeting you shortly after. You and your valuable resources have shaped my career and so many others!. Wishing you a wonderful day and another successful year!! Happy Birthday, Susan! Thank you for your many gifts to us! Your clear-eye, no-nonsense approach to volunteer management has always inspired us. With your help, we’ve brought professional leadership to our volunteer programs.You’ve written about the tools we need to not only manage our programs, but to be seen as professional managers in our organizations. Kudos to your staff for this opportunity to thank you and wish you Happy Birthday! Susan, Thank you for paving the way, for pioneering, for seeing the need, the future, and persevering to create the movement and the leaders in the field today! Truly, heart felt thank you as I've only been in the volunteer field 11 years, I can't imagine it without your tenacity, wisdom, and challenges you set out! I'm blessed to have found what I want to do "when I grow up" and that is lead in the volunteer sector. Without you blazing they way, I may not have had this opportunity. May I and all the others you have influenced, mentored, taught, challenged, and encouraged follow your lead and continue to push forward, influence and make change happen in our corner of the world. Thank you! Most blessed happy birthday to you! Happy Birthday, Susan! "From the Top Down" was the very first book that I read for my CVA. It was -and still is - the clearest and most inspiring publication out there for nonprofit leaders on volunteer engagement. Thank you for all of your contributions to our profession. Your leadership paved the way for the advances that we see today. We wouldn't be here without you! A true leader helps build other leaders - thank you for your tireless efforts in the volunteer field! Happy Birthday, Susan! 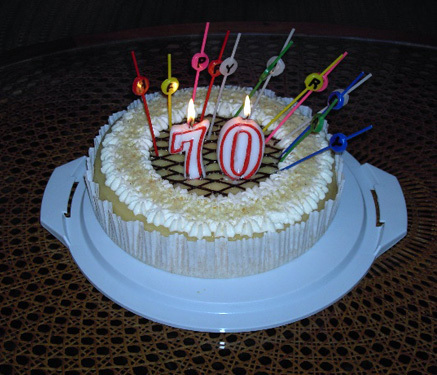 Happy 70 birthday be filled with joy,happiness,successfully today and always,and a good health thorough this year,cheers,sincerely,love Polla. Happy 70th Birthday, Susan !~!~!~! I've never met you, Susan, but feel like I know you. Your hot topics reveal much about your passion for and commitment to our profession. I recommend your website more than any other. Your "From the Top Down" book was a game-changer for me as I was getting my feet wet in supporting healthy volunteerism in churches. I've given a copy to every pastor I've worked with since; it has been an eye-opener for them, and launched many a fruitful discussion. The only time I spoke with you was when you happened to pick up the phone when I called with a technical question about Everyone Ready. Your friendly and helpful response says legions about your leadership style. Thank you for the many ways you have helped me and thousands of others. The impact of your life work is immeasurable, not only in the thousands of volunteer managers you've helped, but in all the volunteers who have been helped through them! I had the pleasure of attending your "Dealing with Difficult People" session in Belfast a few years ago and to say that all who attended thoroughly enjoyed the session and also the humorous way a difficult session was delivered would be an understatement. Our jaws ached from laughing! I left feeling that I was implementing Good Practice within my role well. Many volunteering managers doubt themselves frequently and it is always good to read your blogs and e-newsletter as it gives you confidence that you are getting it right! Happy birthday youngster and thank you for sharing your knowledge and experience. I can't believe it's been 17 years since we met at a DVAVA meeting. Thank you for always encouraging us to push the envelope and get a seat at the table for ourselves and our volunteers. You have been a steadfast champion for all of us, and Energize Inc has been a home base and launching pad for more than you know. Thanks! We hope you have a happy birthday and good year ahead! You have been my model and muse for so many years. Thank you! To your excellent health and many more years of inspiring work. Happy Birthday & Thank You Susan! In 1993, at the age of 44, I made an intentional career change. Fortunately, I was able to participate in your workshops during the early years and thus build a solid professional foundation thanks to your expertise. Over the years we got to know each other and that has been a great gift. After about ten years in the field, I started presenting workshops and I would make reference to your website, monthly Hot Topics, e-Volunteerism (which you encouraged me to write for), and your books such as “From the Top Down”. I have three editions of that book as well as other books you authored. I would often quote you during my workshops when discussing the impact of volunteer efforts with the standard provocative Susan line, “SO WHAT?” This was my opener to encourage discussion about what we do as volunteer administrators, why we do it, what are the outcomes, and how are we proactively promoting/advocating for volunteer engagement and our profession. And most of all, I liked when we would disagree or when you called me out for taking the lazy and/or safe approach. Keep pushing me – just like you have always “pushed the envelope” by example! Susan.... I hope you are soaking up all of the accolades you are receiving. All so well deserved. Over our 40 years of knowing one another, you have been my awesome mentor, challenger, teacher and most important.... a devoted friend. We have laughed, cried, celebrated the ups and downs of the profession (and our lives) and had the amazing satisfaction of seeing our dream come true last July when we successfully encouraged and supported a national/international gathering of volunteer engagement folks to prepare for the future of the profession. No one has contributed more to this field than you and I join the chorus of those reflecting on your astounding impact. I am also thinking of our travels together to China and Tibet and our adventures in San Francisco when we celebrated your 60th birthday. (How can that be 10 years ago?) As colleagues and friends, we have shared more great memories than could fill a dozen books. I cherish them all and thank you for being such a special person in my life. Happy 70th birthday to you and Happy 41st birthday to Energize. Happy Birthday, Susan! I am so grateful for your work in this field, and the credibility you bring to it.